Florida-based experimental filmmaker Roger Beebe is in town and will present a special open-air/backyard-screening of his FILMS for ONE to EIGHT PROJECTORS! 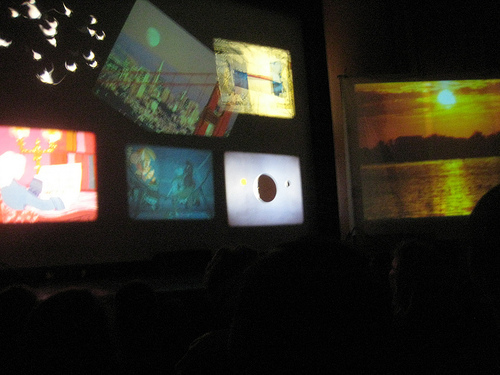 In his film performances, which he has presented around the world, Roger uses multiple analog and digital formats, from Super8 to 16mm to video, running up to 8 projectors simultaneously and combining images live on the screen. His films use found footage, as well as self-produced material, from educational to abstract cameraless films and East German animation movies. FILMS for ONE to EIGHT PROJECTORS is made up of a selection of his recent “expanded cinema” works. We’ll start at 10pm sharp(-ish)! Keep your fingers crossed for good weather and come on over!